"Brava to Miss Porters for having the most comprehensive package with the greatest brand identity and consistency. They clearly invested a lot of money. The student welcome packet is exceptional and must be truly exciting for an admitted candidate to receive — one can only imagine coming home to that bright yellow envelope beckoning from the mailbox and the joy it creates. High marks for creativity in design." "This was an outstanding piece. Writing was fabulous, photography lovely, graphic design clean. Concept was creative. It looks very expensive piece, but given the financial commitment required to send a girl to this school, I think it is appropriate. A class act all the way!" Miss Porter’s School, located in Farmington, CT, is a boarding and day school for girls in grades 9-12. The school is celebrating a number of milestones — its 175th anniversary, record-breaking attendance at open houses and multiple publications awards. The last two accomplishments are the direct result of this enrollment package. Included is information on the school's added value — strategic partnerships, signature programs, and extensive network of accomplished alumnae who are actively engaged with school. 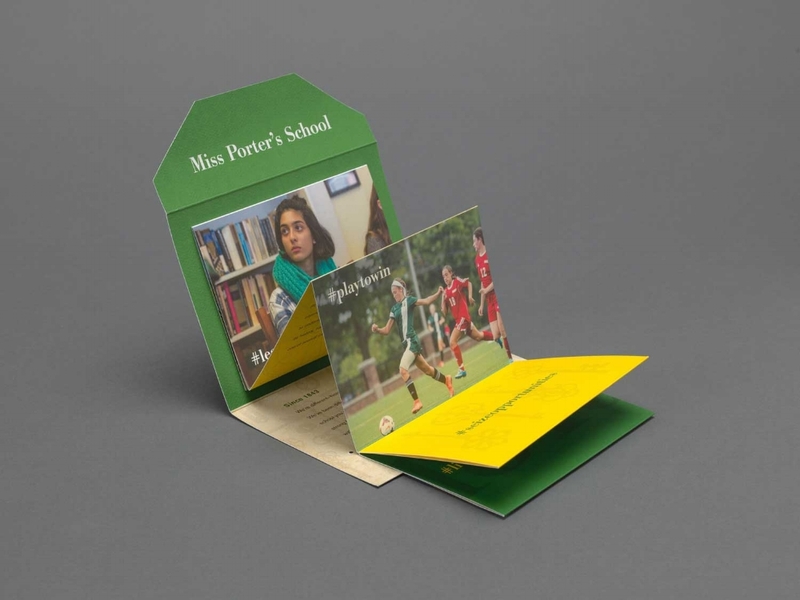 With so many mailings from so many schools, Miss Porter's School wanted to make their case for added value front and center. The package consists of the Leaders Learn Here viewbook enclosed in an eye-catching box, search piece, and yield piece. It’s designed to garner interest and develop excitement about a Miss Porter's School education by telling the story of how the school has educated and developed strong female leaders across generations. It serves as a declaration of the school's mission statement and the outcomes of a Miss Porter's School education. The copy was written by Siobhan Federici, who was Chief External Affairs Officer at Miss Porter's School at the time. 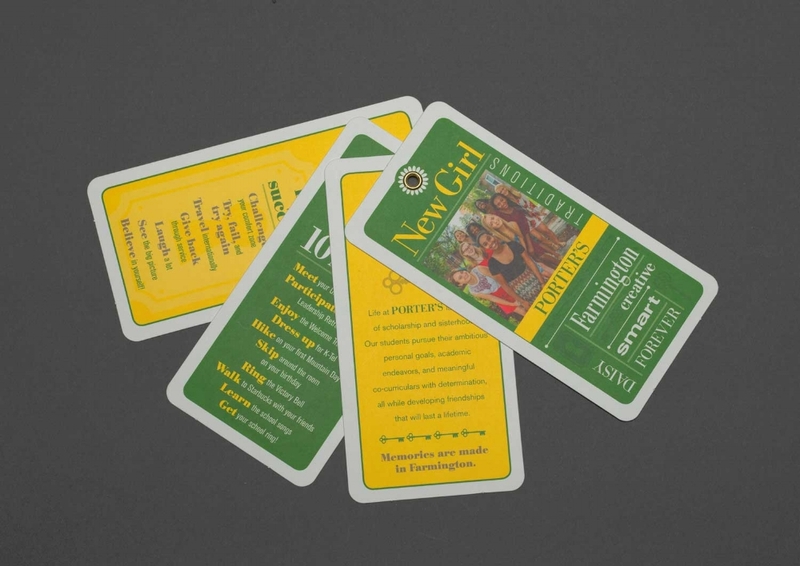 The mailing is designed to grab the reader's attention, packaged in a vibrant green box that is die-cut to display the soft touch, spiral bound book, interestingly closed with a ribbon wrapped key. Playful design elements inspire the idea that the reader (and prospective applicant) has received some very special information. The book begins with a letter tucked into an interior envelope to add an extra layer of intrigue. Short bursts of text with evocative opening and closing lines aid in allowing the reader to remember key facts and details. Added value elements are emphasized on vellum inserts. Fold out content describes the three things Miss Porter's School promises, prepares, and produces. The clear envelope and accordion style cards inspire the idea that they are receiving some really special information. The cards are easily re-purposed as inspirational cards for a bulletin board or locker. Miss Porter’s utilized hashtags to encourage applicants to do so as well and the school uses them regularly in their social media. And if readers bring the key from the cover of the book to their campus visit, they receive additional information, resources, and spirit items. One of the many reasons this package is an award-winner is due to its undeniable "wow" factor. It's a show-stopper with one surprise after another as you dig deeper into the contents. When first viewing the package, folks make comments like "cool," "awesome," and "check this out." The next comments often revolve around its cost, as the judges' themselves noted. "The per year cost for this project was well within what is considered a typical range for a viewbook," Carolyn notes. She explains that there were a number of cost-savings strategies incorporated into the project. One is that Siobhan wrote the piece while working at MPS, so there were no extra writing costs. The photography was completed in the two fiscal years prior to the viewbook redesign and supplemented with in-house photography by a talented staff member. "We pulled already color-corrected photography from previous issues of the school magazine, and printed enough books for three admission cycles, with the costs being spread over three fiscal years," Carolyn says. "I will say that the judges' noting that the design would be cost prohibitive for other schools may not, in fact, be true," says Carolyn. "There are ways to add unique elements for all pieces within all budgets. Discussion is a key part of the process, and CEH Design prides ourselves on the relationships we build with our clients that foster frank, open, and honest dialogue to best reach client goals." The timeline for the package ran from March when the copy was turned over to CEH to September when the printed package was delivered to MPS. The response has been overwhelming for Miss Porter’s. Leaders Learn Here was mailed just prior to the school's November Open House where attendance shattered every other Open House record. Typical attendance hovers around 40 girls, yet 80+ girls appeared as a result of the enrollment package. Miss Porter’s even had to change locations for events in order to accommodate all the students and their families…a happy problem to have for any admissions event.